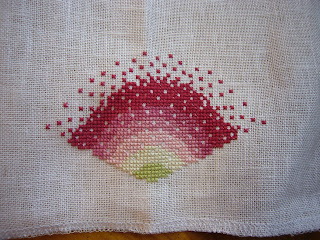 I had one more thing from the June 2010 Sampler Guild of the Rockies June retreat themed Strawberries n Creme. It is a strawberry pincushion designed by talented Guild member Janice W.. I finished the stitching part and hopefully tonight I can get it sewn and stuffed and top it with the pretty ribbon flourish. We will see, I have developed a killer toothache and that may take priority!!! Two advil seem to be helping a bit while I wait for the call back from the dentist. Hope your day is full of strawberries and no toothaches!! If you can get some essential oils at a health food store or Whole Foods, clove is good at relieving pain (put a few drops on your finger and rub it on your gums). Thyme and frankincense (either one or both) are good antibiotic and antiviral essential oils. Again, put it on your finger and rub it on the gum by the tooth. They taste bad, so you need some water after using it, but try to keep it in your mouth as long as you can. Hope your toothache clears up soon. It's going to be gorgeous. Those colors are amazing!